We sell many millions of these pasters each year. The flat black color matches typical "hard cover" shooting arrays found in IPSC and IDPA matches. The color is also perfect for repairing the bulls eye on official NRA pistol and rifle targets. Plus, it's used on black police silhouette training targets like B-27, B-29, and B-34. 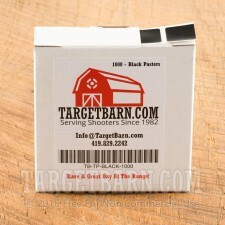 These pasters are 7/8" square with rounded corners and permanent adhesive. 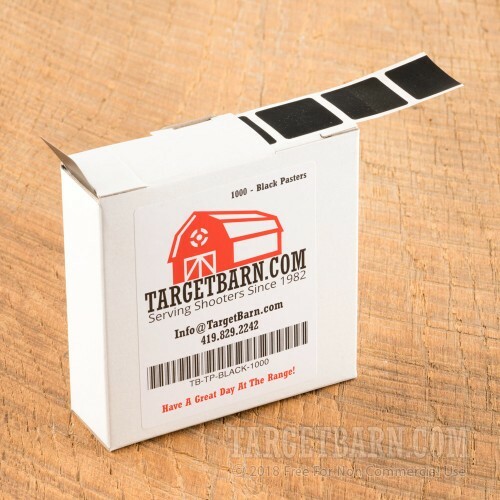 Like all of our Target Barn pasters, they are produced with a flat non-reflective finish to reduce any glare when shooting at targets in bright sunlight. They are sold boxed with 1,000 pasters in each dispenser carton. They are also available in full cases of 40,000 pasters at a reduced price. Great product and very good price,saves expensive targets. Good product, value & fast shipping. Shipping was fast and we're really liking these pasters. Yesterday was a good test for them at our facility. Very damp conditions after morning showers and winds 15-20 knots. They held up well. I recently open a training business for armed security guards. I expect to be doing more business in the future. Great service and fast delivery. These are the best pasters we have used at our club matches; they stay where they are placed. I ordered these pasters and they were delivered on time and were as advertise .